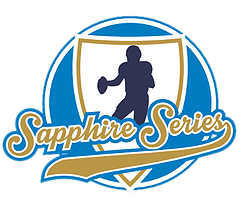 The East Kilbride Pirates women’s team kicked off the 2017 Sapphire Series Division 1 North by hosting the first tournament of their campaign. 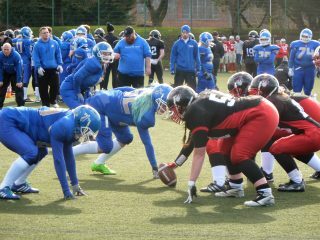 With the Scottish sides having moved up from playing 5v5 to the 7-a-side version, it turned out to be a steep learning curve for both the Pirates and Edinburgh Wolves. 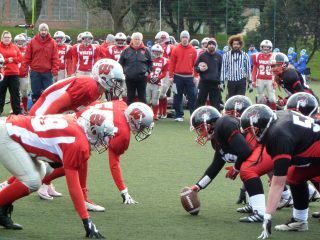 The Wolves lost out 52-16 to Leeds Carnegie Chargers in their opening match as the Pirates faced up to Manchester Titans. The game got off to the worst possible start when Manchester scored on the first play from scrimmage on a strong run by Sian Kersse. The conversion run by Karis Smith was also successful and the tone for the game had been set. EK put together a strong first drive, but Claire Cochrane was stopped short on 4th Down and the ball went back to the Titans. It took them two plays to reach the endzone this time with Kersse again doing the damage. The home side then went 4-and-out and Manchester and Kersse quickly added their third TD. Smith again converted and the Pirates were facing an uphill battle to get back in the game. That task got even tougher when another short drive failed to produce a 1st Down and Kersse capitalised with her 4th TD of the day. Keeley Edmonds converted this time, giving the Titans a 31-0 lead at the interval. The second half got off to a disappointing start when the Pirates fumbled away possession on their first play. Manchester immediately capitalised with Sarah Ul Haq passing to Vicky Evans for the TD although the conversion pass was broken up by Heather McGowan. Again the Pirates dropped the ball in their own half and Manchester made them pay the price when Rebecca Bingle carried home. Becca Asquith came up with a QB sack on the conversion try to hold the score at 43-0. The same player got the Pirates first points of the day on Manchester’s next drive, when she again sacked the QB, this time in the endzone for a safety. The second game of the day saw the Scottish teams go head to head, with the Wolves out to avenge their narrow defeat to East Kilbride last season. The first half was a tense affair with defences on top. Half time arrived without either side having threatened the endzone. After the break an early Angela Wilson interception gave the Pirates good field position but they were unable to take advantage. Edinburgh then took the lead on their next drive on a short run by Fiona Lynch, and although the conversion attempt failed, the Wolves had their noses in front. The curse of the fumble then returned to haunt the Pirates and Edinburgh made the most of the short field with Kat McDougall running the ball home for another unconverted TD. It only remained for the Wolves to cap their day off with a 7-play drive ending in a rushing TD for Amy Wright and a final score of 18-0 in their favour. The Pirates now head off to the second round of games in Derby on March 11th.